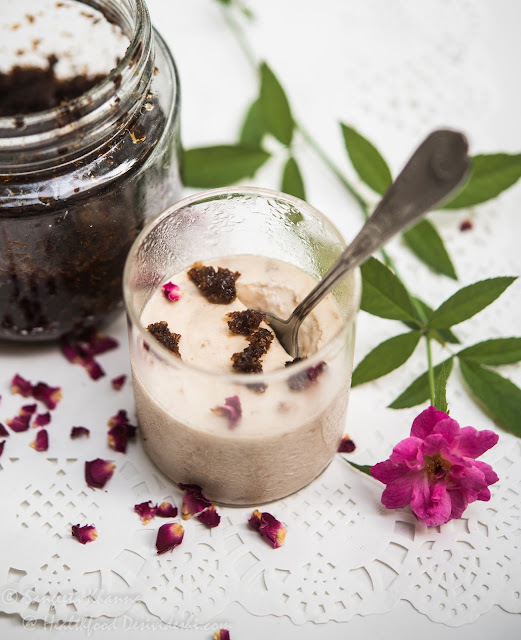 I know you might not be drawn to the thought of rose petal jam or gulkand phirni, unless you have experienced otherwise. Rose is a tricky aroma when used in foods I always used to think. I never liked it whenever I tried it in my childhood and was put off Rose scented foods, drinks and desserts. It was when I started growing the heirloom variety of roses that I was tempted to use them again in my food and I understood what was the reason of my hatred towards all things rosy, at least in food. The reason is, that most (read almost all) rose scented drinks and desserts are made from synthetic essence of rose and hence makes one averse to this aroma. If you have ever had experienced a real rose water like we get from IHBT Palampur, you would know what the real thing is and different varieties of roses yield different bouquet of aromatics. Once you grow the real aromatic roses you would know even better. These flowers are small in size, get even smaller when the garden is mostly shaded, but the aroma is unmistakable. 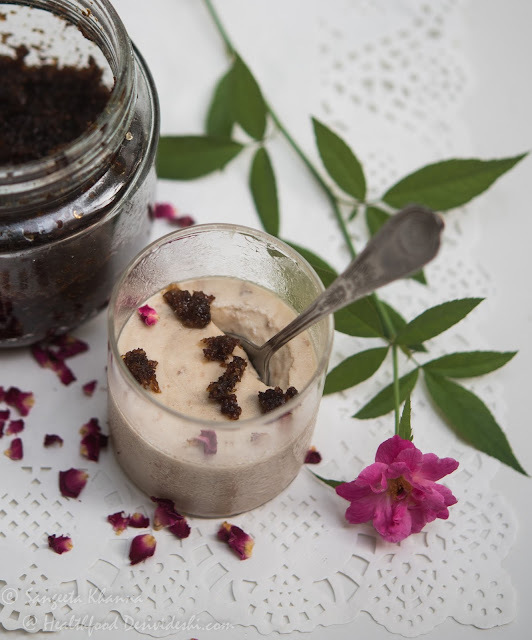 This Rose petal jam (Gulkand) phirni is a testimony to the real flavour. I made this gulkand phirni when a few friends came visiting recently and I wanted something that cooks fast and takes lesser effort as my hands and fingers have really stiff joints right now due to a recent Chikunguniya infection. This gulkand phirni came to rescue. Reserve 100 ml milk and mix the cream and rest of the milk in a thick base pan and simmer. Add sugar and let it dissolve.Keep simmering till the volume reduces by about 20%. keep the flame low at all times. Make a slurry with the reserved milk and rice powder, whisking it nicely. Take a whisk in the right hand and pour the rice slurry into the simmering milk using your left hand. Keep whisking the mix all this while. The simmering milk and cream mix starts getting thicker like a custard and a few fat bubbles burst at the surface. The whisk starts getting coated too at the same time and this is a sign the phirni is cooked. It takes about 3-5 minutes depending on the heat. Take the phirni off the stove, add rose water and gulkand. Whisk again to mix. Pour into serving bowls or glasses. It is best served in earthen pots but any bowls are okay as long as the phirni gets chilled and set. .
Chill before serving as I mentioned, garnished with rose petals and a little gulkand. The phirni should set like a soft grainy custard. The creaminess comes from the rice starch and the light cream used in the recipe and glukand provides the flavour base. There are only 2 ingredients needed to make Gulkand. The quantity of rose petals and sugar is equal by weight so sugar helps preserve the rose petals along with their essential oils. 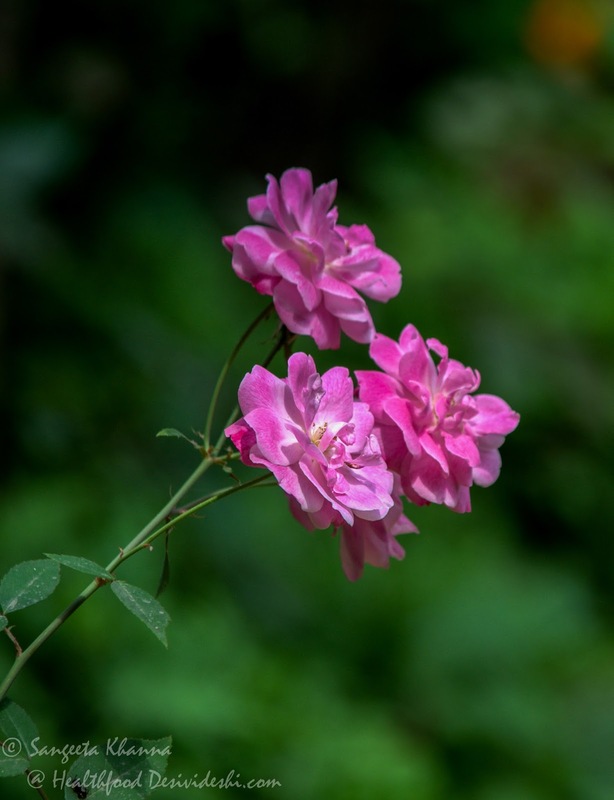 We need the heirloom (desi) variety of rose known as Damask rose. This variety has very soft delicate petals and a lingering fragrance. The flowers can be multi-whorled or single whorled depending on where they are growing, pruning pattern, sun exposure and climate. 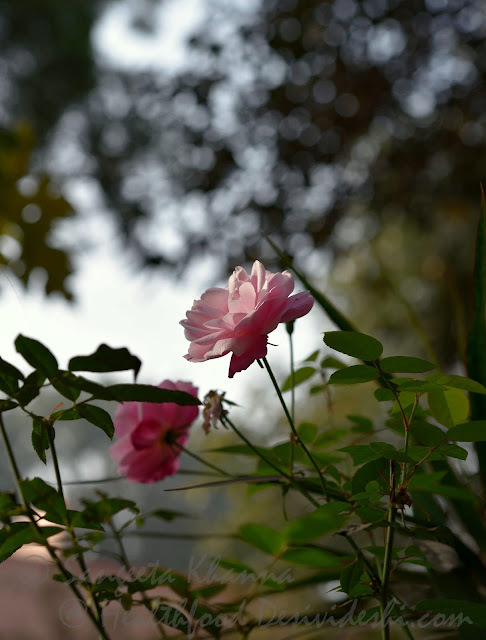 In the states of Uttarakhand and lower Himalayas the Damask rose grows wild by the roadsides and comes in huge bunches. The rosehips from those roses are the best. Deep pink variety of Damask rose is preferred over the light pink rose to make Gulkand or rose petal jam. Once you have the roses, better get them from a chemical free source, I collected them over a week when my garden was benevolent a couple of years ago, just separate the petals and rinse them lightly under running water. Spread the petals over a muslin cloth in shade so the water evaporates. 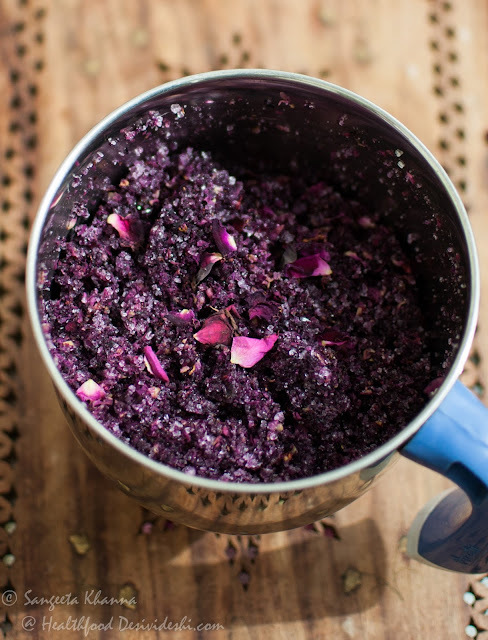 The older method warrants crushing of rose petals in mortar and pestle slowly but I use a mixie blender whenever I have a good quantity of rose petals to preserve. It takes just a couple of seconds for a batch and the mixture doesn't get heated. Heating the mix would result in the loss of the aroma. To make fresh gulkand from a couple of roses within a day I just crush them along with sugar, keep in a glass jar and expose to sun for a day. Here is how it looks when rose petals and sugar are crushed lightly in a mixie blender. You can use a food processor and even a chopper. After crushing them together coarsely, just transfer to a sterile (clean and dry) glass jar with a tight fitting lid and keep indoors at room temperature, away from sun to preserve the colour. The gulkand stays well for years but the colour gets darker as you can see from the pictures of freshly made gulkand above and the 2 year old batch in the picture with Gulkand phirni. And don't worry about the high sugar content of gulkand. It is never used as a jam spread but always as a rose flavour to be added to desserts so the sugar gets balanced. Damask roses traveled from Persia to Europe, the name of the rose comes from Damascus Syria. I am not sure how these roses came to India but now they are called as Indian desi gulab. It might have come to India via older trade routes as there has been a considerable exchange of such commodities between the middle east and India. I will update this post if I get any information about how Damask roses came to India. Please share if you know anything about that. Till then, make some Gulkand whenever you get a few Damask roses or desi gulab. 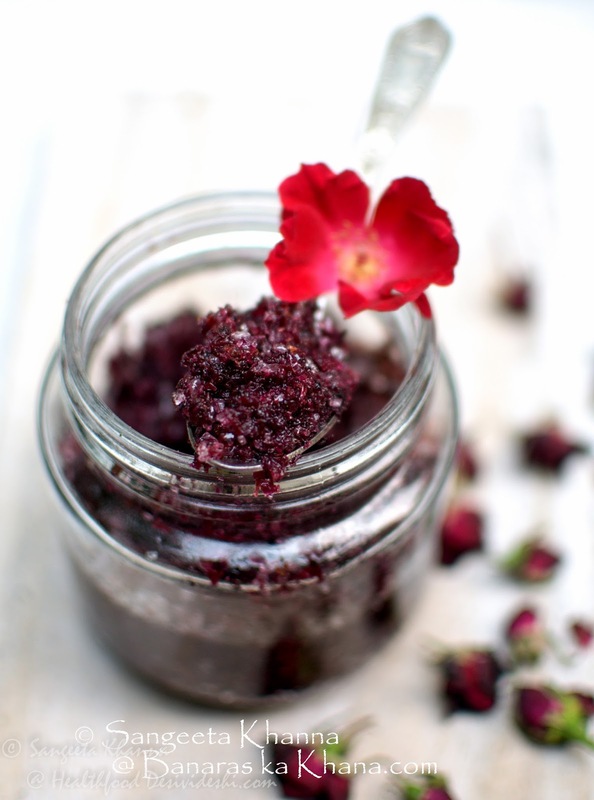 You will be hooked to make this rose petal jam that doesn't need any cooking. And the gulkand phirni will be a preferred dessert at home I must tell you. The real ingredients have the taste, the chemical essences just fool our senses and sometime kill them too. Please don't let that happen. Thanks Astha. Yes even we used to make with the few roses that bloomed everyday. 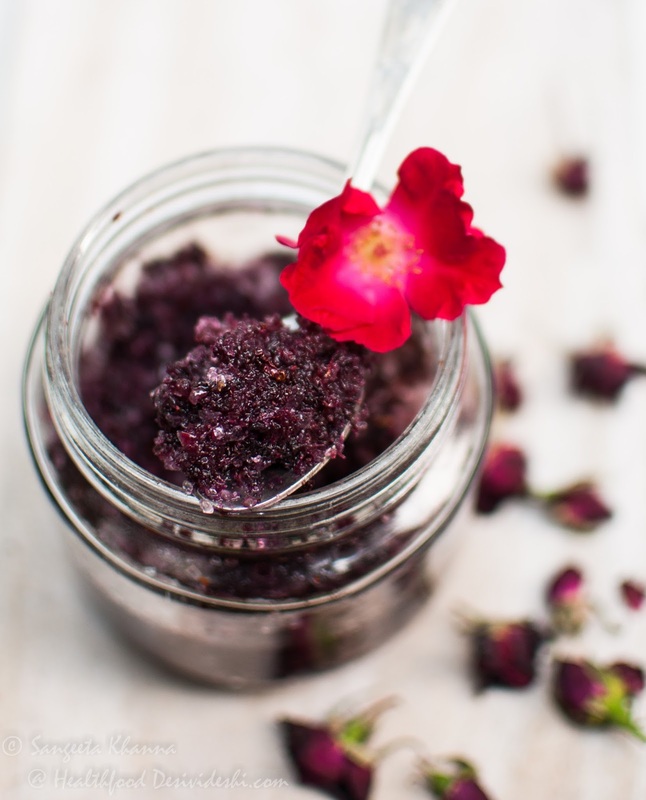 We would keep adding more rose petals and sugar everyday till the jar was full and kept in the sun every single day. I think this preserve would be the oldest tradition if I am not wrong.